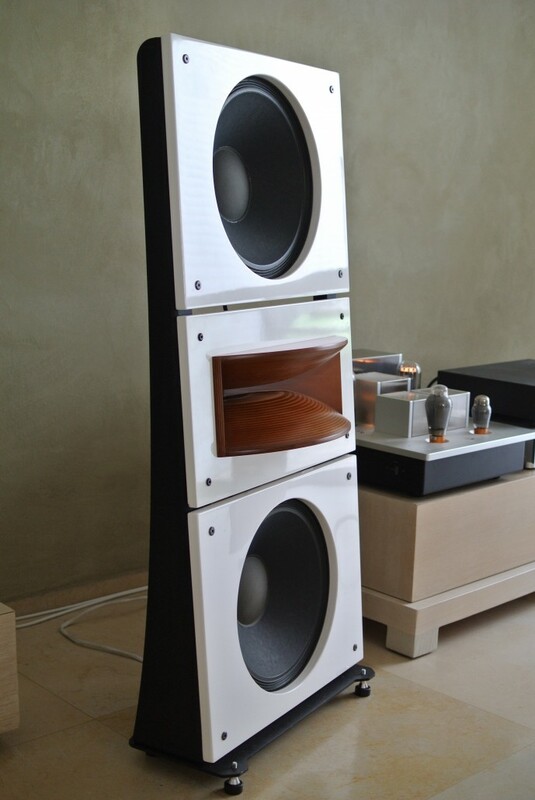 vpiforum.com • View topic - Is this your Pure Audio speaker configuration? Is this your Pure Audio speaker configuration? I know this is a turntable forum, but your comments on your Pure Audio Quintet 15's has me wondering which configuration do you own, given you have mentioned a "horm" module. Is this it? It seems I slept(missed) attending a show in Oakland where I may have been able to hear them. Unlucky me! Last edited by MMMC on Mon Aug 20, 2018 1:19 am, edited 2 times in total. Re: Is this your Pure Audio speaker configuration? I am using the PAP-1 German made horn ( orange wood color) in the center of my four 15" woofers on the curved speaker fascia. I also have the Tang Ban on a set of Trios with two 15" woofers. The Tang Ban actually integrates very, very well with the woofers but the speed and detail and efficiency of the PAP-1 horn is breathtaking. With 20 ultra clean solid state watts per channel you can reproduce concert hall levels and still not stress the system. In many ways this is as good or better than my JBL Everest's for one seventh the price. Wondering if the quintet is easily toppled over? The photos look like it may be with kids around or clumsy adults. Thanks Harry. Is it possible to mount the horn on top of the 2 woofers? I'm thinking this may be more in line with ear level and improve mid-high frequency response, although this may not be much of a factor with a wide dispersion horn. Also, can the Trios be purchased now and expanded to the Quintet at a later time? If you let them know they can tap the frames to fit the horn on top but I find that a 6" thick block of MDF with the Trio's bolted to it sounds the best and the block sitting on tip toes. Raises the horn enough that dispersion is not an issue and the mass at the bottom makes the speaker sound cleaner. I do not have children running around and the Quintets seem stable enough but I would add the block of MDF below them also for stability and cleaner sound. These speakers are a bargain for what they cost, The horn is faster than my Quads and ML's and the bass is as clean as my JBL Everest's just not as deep and impact rich but still more than anyone needs and 1/6 the price!!!!!!!!!!! Plus, they run to ear bleeding levels on 20 watts. VPI's EE Mike Bettinger built me a pair of absolutely clean 20 watt SS amps and I will never go back to tubes after hearing these.